Yesterday, I posted the Top 10 List for Buyers in the 2012 San Carlos Real Estate Market. Today, it’s the sellers’ turn. 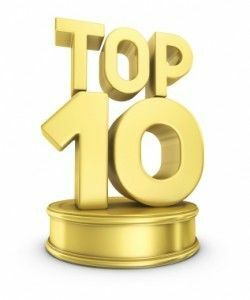 Below is the Top 10 List which should help those thinking of selling their San Carlos home in 2012. (1) Your Representation. It all starts with your representation. The agent and brokerage you choose in the sale of your home will be an extension of you. My advice would be to choose an agent that is not only San Carlos based, but specializes in San Carlos. Choosing a local agent will simply give you better odds at selling your home for a higher price and in a more efficient manner. San Carlos agents know other San Carlos agents and they often know what the clients of other San Carlos agents are looking for in a home. They will simply have a better understanding of the market. (2) It Takes a Team. It’s more than just an agent. You need a full team. The agent, stagers, designers, landscapers, contractors, cleaners and a host of others. It will help the efficiency of the process if your agent already has his or her team in place. (3) Stage it. One point that I try to drive home to all of my sellers is that you only get one shot to impress buyers. This means that every part of the house must show its best by the time the first buyer walks through the door. Most buyers make up their mind in under 60 seconds. Either the house resonates with them, or it does not. Some homes benefit from a full staging, while others look best with a redesign and some carefully chosen accessories. Your agent can advise you on the best route for your home. (4) Conduct Property Inspections Ahead of Time. The title pretty much sums it up. First, always conduct a property inspection. Some sellers do not do this in San Carlos and it can really leave them wishing they had. It is best that any prospective buyer understands the issues ahead of presenting you with an offer. If they agree to purchase the property, I can almost guarantee that it will be contingent on the buyer conducting and approving a property inspection. There will be items that need correction in each San Carlos home. At that time the buyer will come right back to you looking for credits. Conducting a thorough property inspection ahead of time eliminates the re-negotiating. Additionally, you should conduct your property inspection with enough time before the anticipated market debut date so that you can correct any minor issues that pop up in the report. (5) Disclosures. Do not take them lightly and insist that the buyer sign them ahead of presenting you with an offer. There are a variety of legal pitfalls that you will avoid by handling it in this fashion. If you have a tricky disclosure, run it by the broker of record for your agent or your attorney. Seller initiated disclosures are a lightning rod for legal actions. Recognize that some buyer’s agents will try to get around having the disclosures signed ahead of time because of time constraints or laziness. Don’t let it go. Insist that they are signed. (6) Open Houses Do Work. I’ve read a variety of real estate articles and blogs which say that open houses do not work. I can tell you with 100% certainty that they do work in San Carlos. I think you will find that most people who recommend against open houses either do not have their license or have very little experience in selling homes. I would estimate that at least 60% of the homes I have sold in San Carlos over the last few years matched its buyer at an open house. This ties in to number (7), below. (7) Realize That Many Buyers Are Touring Without An Agent. Understand that the way buyers are previewing homes has changed. Most buyers are not initially touring homes with their realtor. The more common scenario is that the buyers end up touring homes on open house by themselves. They either saw the home online or were instructed by their realtor to go see it. I would estimate that two out of every three buyers coming through open houses in San Carlos are doing so without their agent. Recognize that you need to slightly adapt your strategy>>> With some buyers touring on their own, recognize that your marketing needs to change as well. We have found that how you market online is critical. For example, it is not enough to blanket sites with the listings, you need to take it a step further and provide all crucial information up front. You also need to make it easy to show. We have worked with a fantastic vendor which has given us the capability to not only to designate a site specific address such as www.123mainstreet.com, but those sites now allow the user to get unlimited access to features of the home with ability to connect with the listing agent immediately, either through phone, text, twitter, email or even Skype. It’s a good way to make sure that you never lose a potential buyer whose agent is not acting quickly enough to show the property. (8) Dealing With Neighbors. It sounds terrible, but there is a saying in San Carlos that says most neighbors will never spend more time in your house than when it is for sale. We have all been there and experienced it. The sign goes up and the neighbors want to know what is happening. Truthfully, I don’t blame them. Their biggest asset is somewhat tied to what price you obtain for your home. Where it gets to be a problem is when they are consuming the listing agent’s time at an open house talking about everything but purchasing the house. The listing agent’s time should be reserved for answering the questions of serious buyers. There are a few ways to mitigate the impact with neighbors. Your agent should be able to advise you accordingly. (9) Time Of Year For Your Sale Is Important, But There Are Other Considerations. Most people believe that spring time is the best time to sell your home. I’ve always considered the best time to sell your home to be when demand is high and inventory is low. Granted, spring time does allow for yards to be in bloom and it does allow for a spring purchase and a summer move, but this is really a mid-west and east coast proposition. In fact, often times the worst weather for us in the springtime. I believe it rained into June last year. Bottom line, for San Carlos the “spring is the best time to sell” saying, is not always true. (10) Have Flexibility With Your Market Debut. A common mistake for some San Carlos sellers centers on their market debut. The worst thing you can do is pick a definitive date and go to market. The better move is to pick a prospective date, wait and see what your competition is like, and then go to market. For example, if you want to go to market on Friday, the 12th, and on Thursday, the 11th, two new properties come on the market that are similarly priced to yours, you may want to push your market debut off for a week. Your goal should be to grab all of the attention for that particular weekend. Having some flexibility will serve your home well.